This hallmark text introduces the exciting world of soils through clear writing, strong pedagogy, and an ecological approach that effectively explains the fundamentals of soil science. Worked calculations, vignettes, and current real-world applications prepare readers to understand concepts, solve problems, and think critically. 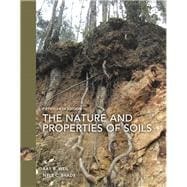 Written for both majors and non-majors, this text highlights the many interactions between the soil and other components of forest, range, agricultural, wetland and constructed ecosystems. Now in full-color, the Fifteenth Edition includes hundreds of compelling photos, figures, and diagrams to bring the exciting world of soils to life. Extensively revised, new and updated content appears in every chapter. Examples include: coverage of the pedosphere concept; new insights into humus and soil carbon accumulation; subaqueous soils, soil effects on human health; principles and practice of organic farming; urban and human engineered soils; new understandings of the nitrogen cycle; water-saving irrigation techniques; hydraulic redistribution, soil food-web ecology; disease suppressive soils; soil microbial genomics; soil interactions with global climate change; digital soil maps; and many others. Elected Fellow in 2003 of both the Soil Science Society of America and the American Society of Agronomy. Weil has been active in soil science research since 1972 and has made many contributions in the areas of nutrient cycling and management, environmental impact of soil management, and assessment of soil quality. His current research is focused on the assessment and improvement of soil quality and organic matter. He has conducted research in several countries outside the United States, including Ethiopia, Chad, Brazil, Honduras, Sri Lanka, Zimbabwe, Malawi and Tanzania. In addition to his teaching at the University of Maryland, he has conducted many training workshops for such agencies as the USDA, The World Bank, The Rodale Research Institute, and the International Food Policy Center. Dr. Weil has authored or coauthored more than 100 scientific publications in soil science and related areas. Dr. Brady has, since 1947, worked in education, research and research administration, focusing on both international and U.S. issues. He is past president of the SSSA and served six years as Editor-in-Chief of the SSSA Proceedings and is Emeritus Professor at Cornell University. He has served in leadership positions with Cornell University, the International Rice Research Institute, USAID, the United Nations Development Programme and the World Bank. He is recognized around the world as author and co-author of eleven editions of the world's most widely used soil science textbook, The Nature and Properties of Soils.